STO. TOMAS -- Aspiring local officials in this town committed Tuesday, January 22, to lead peaceful and orderly local elections by signing a peace covenant at the St. Thomas the Apostle Parish. Candidates for different local government positions joined in the covenant signing, which aims to promote safe and fair conduct of upcoming midterm elections for the benefit of the Tomasian community. 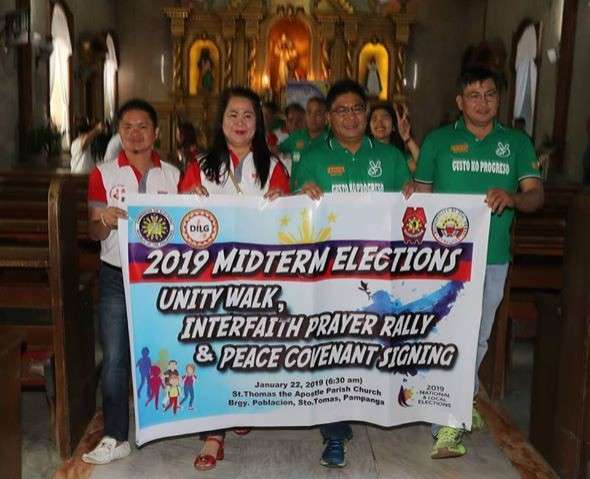 Local Election Officer III Imelda Manalastas said the activity, which was kicked off by a holy mass, successfully gained the commitment of aspiring local officials to become responsible candidates during and even after the election period. Each candidate signed an integrity pledge and participated in the unity walk to showcase their willingness to adhere to the rules and regulations set by the Commission on Elections, Manalastas said. “We are hopeful that each one of them will fulfill their pledge to let the voters decide, and respect whatever the results of the election will be,” Manalastas added. Chief Inspector Jayson Constantino, the town’s chief of police, also urged candidates to avoid engaging in violent and unruly activities, and always consider the welfare of their constituents in their decisions. He also assured candidates that the Philippine National Police will remain non-partisan and unbiased to any group, and will only perform its duty of serving and protecting the people. Mayor Johnny Sambo, who is seeking his second term as local chief executive, meanwhile, expressed his hope that peace, unity and the love for the people will reign this coming elections. “Our prayer remains the same, that no Tomasian will be hurt or shed blood in exchange of the aspiration of a single candidate to gain powers. We came here due to our common goal of serving Tomasians, so let us let them decide,” he said. Sambo also rallied his supporters and followers to be responsible in their action, and not let their anger take over their goal of promoting a more developed and progressive future for their hometown. Vice Mayor Gloria Ronquillo, who is also seeking the mayoralty seat, urged his fellow candidates to avoid mudslinging and engaging in dirty politics, rather just present their platforms to the people. “Let us veer away from the old politics of demoralizing your opponents. Election day is just one day but beyond that, we are public servants. Let’s just present our platforms and let the people make their decisions,” she said.